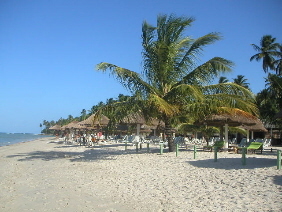 Porto de Galinhas is conveniently located just about 80 km from Recife, the state capital of Pernambuco. 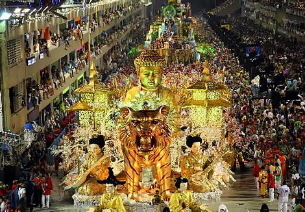 Recife, on the other hand is one of the principal airports of northeastern Brazil and enjoys an easy access both nationally and internationally. Getting transferred from Recife to Porto de Galinhas is simple and a rental car can be a perfect choice for those who are not afraid of driving and enjoy discovering the attractions of their own. Porto de Galinhas itself is one of the most popular holiday villages of northeastern Brazil and has a well developed infrastructure even for the most demanding tastes. The accommodation range varies from a simple pousada to the most luxurious bungalows with private pool. Porto de Galinhas serves both families and singles, has a large variety of restaurants and bars for all the tastes, and pampers even those who enjoy spending time is high quality boutiques buying souveniers and items of latest beach fashion. That’s what Porto de Galinhas is all about. Beside of the infrastructure Porto de Galinhas enchants with its’ natural beauty. It’s a destination of crystal clear waters, swaying palm trees and pictoresque landscapes. 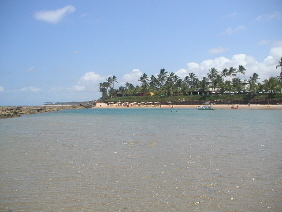 Some of the principal attractions of Porto de Galinhas are the natural swimming pools located in front of the village. They are ideal places for snorkeling allowing you to discover the wonders of submarine life. These swimming pools appear during the low tide and due to the proximity they can be accessed on foot. 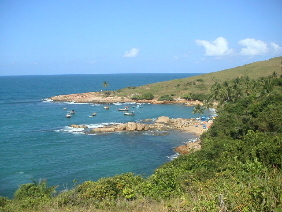 Qualifield divers will also find a number of interesting diving spots from the region of Porto de Galinhas. Another interesting place with reefs and a natural pool is the beach of Muro Alto, just few kilometers of distance from the village of Porto de Galinhas. When it comes to the nearby destinations one of the most interesting places to be discovered is Cabo de São Agostinho with its’ beautiful beaches of Calhetas, Paraiso and Gaibu. In the region you will also have a chance to treat your skin with a bath of argil. These destinations can be visited either on your own (if you ended up renting a car) or as part of a group excursion. South of Porto de Galinhas you will find more incredible beaches such as Tamandare with different tones of blue and green and Praia dos Carneiros, a beautiful and peaceful beach with quality infrastructure. If you end up driving down on the coast you will reach the boarder of Alagoas and an another interesting holiday destination Maragogi, which is quite a lot more simple than Porto de Galinhas, but combines perfectly with it. In a nutshell Porto de Galinhas is a destination of a traveller who appreciates easy access, high quality accommodation, large variety of restaurants, and wants to have a stressless holiday surrounded by fascinating nature. Pousada Perola do Porto – A well located pousada with excellent infrastructure. Spacious rooms with a private terrace/balcony, just a short walk away from the hearth of the village. 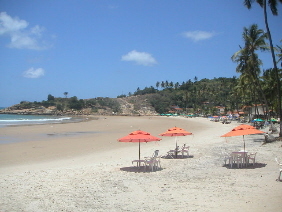 Nannai Beach Resort – A high quality resort located in front of Muro Alto beach. Offers different room types including lovely bungalows with private pools. Highly recommended. Often we hear people wondering how far one city is from another. In a map many of them look like to be quite close to each other, but the reality might be something different. That’s why we wanted to give you a clearer idea of the dimensions listing below examples of distances and average flight times between the major tourism destinations of Brazil. Please not that the numbers mentioned are air distances and driving from one place to another means, with no exception, many more kilometers on the road. The flight times, on the other hand are average times based on direct connections with domestic airlines. During rush hours more time might have been reserved for flying in between the cities mentioned. 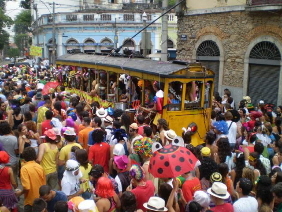 Hope you will find this simple information useful when planning your trip in Brazil. For distances between any other city use the distance calculator.